John Kerry’s definition of the U.S. rebalance to Asia is far different from Hillary Clinton’s original description. As my colleague Zach already noted, U.S. Secretary of State John Kerry delivered an address on U.S.-China relations in Washington DC yesterday. 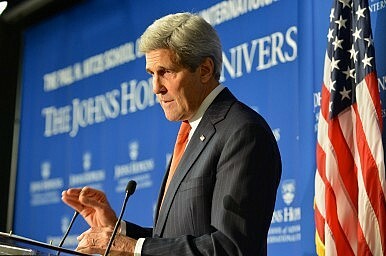 While the majority of his speech was focused on the U.S.-China relationship in particular, Kerry also spent some time describing the U.S. “rebalance to Asia” – in in doing so, provided hints that the nature of this strategy has shifted since the “pivot to Asia” was first announced in 2011. Kerry’s updated definition of the rebalance differs in several key ways from Clinton’s original description. In Kerry’s formulation, the economic aspects of the rebalance (particularly the TPP) are now front and center, topping his list of policy goals. On one level, this could be simple political posturing – the TPP negotiations have hit a snag, and more high-profile emphasis from the Obama administration may be intended to add new momentum to the talks. But it’s no coincidence that this shift in emphasis addresses the criticism most often leveled at the “pivot to Asia” policy by Chinese analysts. Kerry’s new definition of the rebalance directly refutes this criticism. Economic development and sustainable development (powered by clean energy) are now at the forefront of the “rebalance to Asia” strategy. Conversely, the military arm of the pivot, which was such an integral part of Clinton’s original formulation, is nowhere to be seen in Kerry’s four goals. To be sure, the U.S. commitment to its security alliances is implied in Kerry’s commitment to “strengthening the institutions… that contribute to a rules-based, stable region.” But it is significant that Kerry does not give strengthening alliances its own bullet point, as Clinton did, nor does Kerry stress the need for a “broad-based [U.S.] military presence” in the Asia-Pacific. When Obama declared in November 2011 that “the United States is a Pacific power, and we are here to stay,” it was in the context of announcing the additional deployment of U.S. Marines in Darwin, Australia. From then on, the pivot to Asia largely acquired military overtones, deepening China’s suspicions that Washington’s new Asia strategy was little more than a veil for containment. Chinese analysts interpreted the “rebalance to Asia” to primarily mean shoring up U.S. security alliances in the region as a way of counteracting China’s growing military strength. Over the last few years, however, the Obama administration has slowly shifted its focus from the military to economic and diplomatic issues. This is partly out of necessity – the decision to actively combat Islamic State in Iraq and Syria has diverted the Pentagon’s attention from the Asia-Pacific, and the crisis in Ukraine refocused foreign policy on lingering strategic issues in Europe. Simply put, the current global situation will not allow a single-minded focus on the Asia-Pacific. As a timely reminder of this truth, Secretary of Defense Chuck Hagel was forced to postpone a planned trip to Vietnam and Myanmar. However, the decision to downplay the importance of military deployments as part of the “rebalance” strategy may also be a conscious choice. De-emphasizing the military aspect of the rebalance in favor of economic engagement provides less ammunition for Beijing to complain of containment. The inclusion of fighting climate change on the rebalance agenda, meanwhile, provides clear room for cooperation between Beijing and Washington within the framework of the “pivot to Asia” – something that was largely missing in the original definition.